Tourist Zones 1 to 5 of the Ranthambhore national park, that close for three months of July, August and September every year because of monsoons rains, re-opened for visitors on the 1st October 2017. 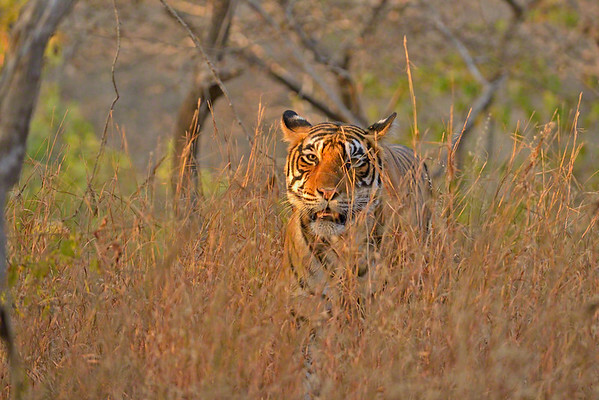 Zone 6 to 10 that are on the adjoining sanctuaries of the tiger reserve stay open throughout the year. There are right now 11 tigresses with over 20 cubs in the tiger reserves and the upcoming season looks promising despite the fact that the reserve got little rain in the monsoons months. Theo Allofs is one of the best nature and landscape photographer in the world. He has been a full time professional photographer for over 30 years and has won almost every prestigious award that there is on the planet. 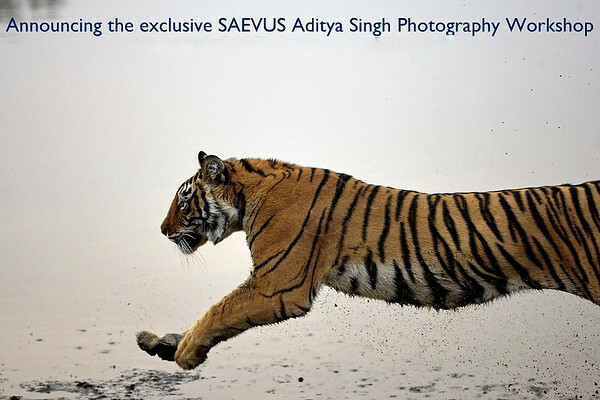 He is one of the very few professional nature photographer in the world. In our opinion there are not more than 20 true professional nature photographers in the world. Amongst the many feathers in his cap is the fact that he is one of the founding members of International League of Conservation Photographers. 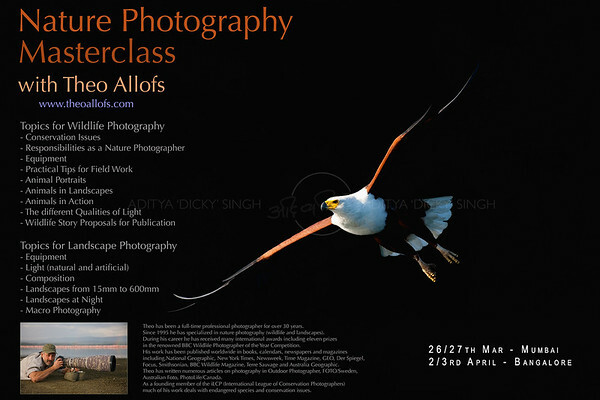 We are organising a series of workshops by Theo Allofs in India for medium to advanced level photographers. The workshops are on 26th and 27th March in Mumbai and 2nd and 3rd April 2016 in Bangalore . The cost will be Rs 20,000 plus 3.63% Service Tax for a one day workshop . There will be two sessions of 3-4 hours in one day with lunch in between. During a one day long workshop Theo will teach medium to advanced photographers all essential tools to increase their wildlife and landscape photography skills. His presentation supported by many sample images projected on a large screen will help understanding the power of light and composition - the basics of photography. But he will also share his secrets of how to achieve award-winning images and will help you to widen your vision and extend your personal limits. Theo will explain what makes an excellent image, why “less is more” in a landscape photograph and how to open your mind to see opportunities when conditions are far from being photo- perfect. The workshop is divided into two parts – landscape and wildlife. After each part there will be ample opportunities for questions. We do not if there is any wildlife lodge in India whose regular guests have won seven awards in the Jackson Hole Wildlife Film festival. This film festival is held every alternate year and is by far the most prestigious wildlife film festival in the world. Any wildlife filmmaker would be on top of the world if their film is screened at the festival, winning either the category award or the best of the festival (called the Grand Teton Award) is a lifetime accomplishment. Our close friends John Murray, Cepa Giblin and Colin Johnson (of Crossing the Line Films) won the Grand Teton award in 2011 (For their film "Broken Tail" which also got two more awards) and again in 2013 (for their film called "On a river in Ireland" which again won two more awards besides the big one). 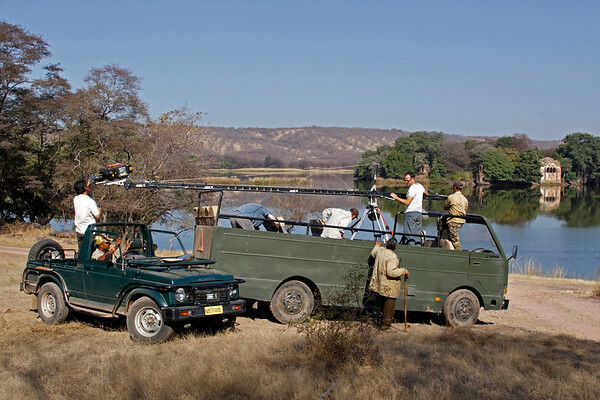 They have always wanted to do the ultimate Ranthambhore tiger film in co-production with the Rajasthan Forest Department, though I am not sure if they will ever get the required permissions to do so. Oliver Goetzl and Ivo who were filming here last year had their film "Jungle Book Bear" in the final rounds of this years competition had won the award in the newcomer category for their film "Wolverines - Hyenas of the North" in 2007. 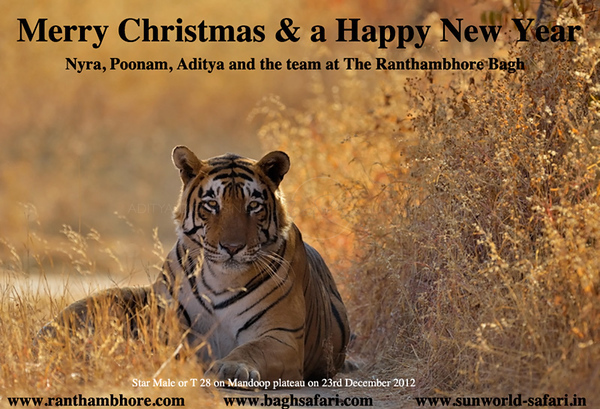 After all The Ranthambhore Bagh is for those who are serious about wildlife. Best of Festival "Grand Teton Award"
On the 23rd December evening someone had seen pugmarks of T 17 and her three cubs in the Mandoop plateau. She has been spending most of her time in a place called Kachida valley and we were happy that she was near the lakes (Mandoop is very close to the lakes). 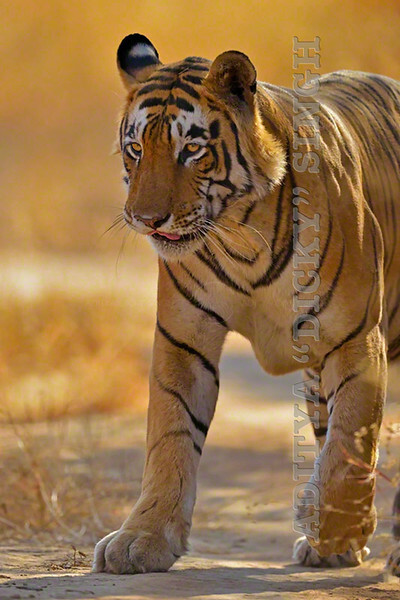 The next morning we went to Mandoop and found fresh pugmarks of T 17 and a male tigers. We heard a lot of crows calling close to the road in Mandoop and when we went there we found Star male (T 28) sitting just off the road. There was a Spotted deer carcass lying close by and the crows were waiting for the tiger to move, before they got their fill. Soon enough the male tiger got up and moved off. He was limping badly. (picture below). We assumed, based on the evidence of pugmarks and the kill, that T 17 had made a kill and got her three cubs to the place. Some time in the night the Star male reached there and snatched the kill from T 17. They must have had a fight, as we could see that the male had an injury on his front right leg. We assumed that T 17 must be hurt too. That evening one jeep saw T 17 and one of her cub at a waterhole near Kachida and reported that she was limping badly. (Picture below). 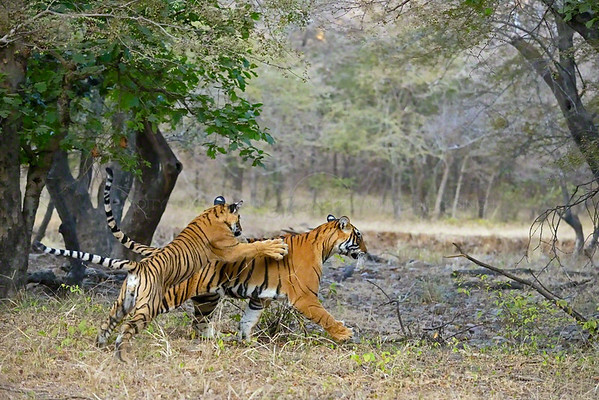 The forest department was alerted and a team was formed to look for T 17 and her cubs. Kachida valley has many inaccessible areas and we know that finding an injured tiger there would be a task. last evening (28th December) T 17 was seen opposite the Kachida check post. She had a big injury on her front left leg and was limping very badly. Her cubs were not with her. We reported this to the forest department and they immediately dispatched the range puffier and the entire flying squad. Later on I heard that she was given a live bait, that she took eagerly. Since her injury is in a place where she can lick her wounds, it is not so bad. Though she would need some help in getting food for the next few days, till she is back on her feet. Star male has recovered from his injuries and is not limping anymore. 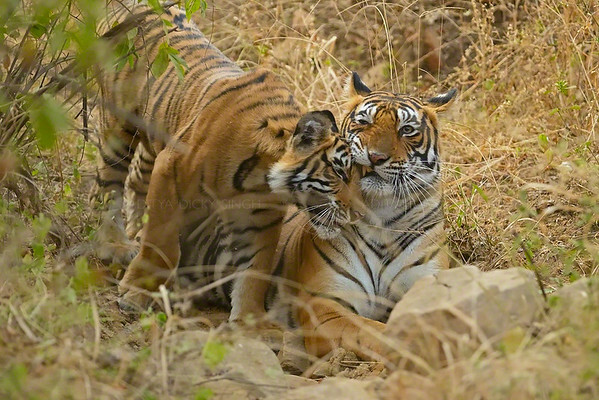 The struggle that a tiger mother has to go through to bring up her cubs is amazing. Hats of to another great wild mother. 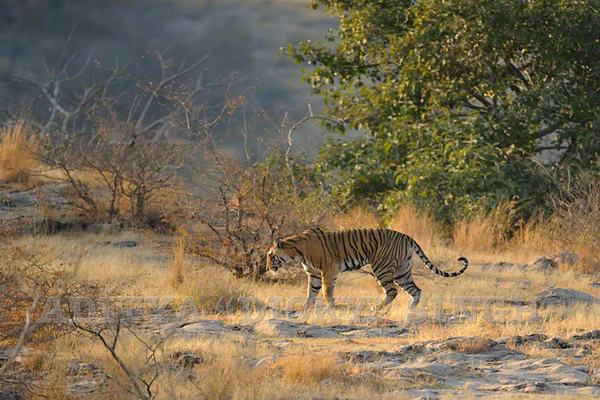 Two days ago I came across a male tiger - T 28 or Star male in the Mandoop plateau of the Ranthambhore national park. A few days ago he had fought with another tigress (T 17 or Sundari who is a mother of three cubs) over a kill and both the tigers had been limping since then. We found him sleeping on the track near the Mandoop talai - good light in open short grass plateau. Unfortunately the tiger was in no mood to move.